Dublin is one of the sites of what the Irish call The Troubles. Before The Troubles, a minority of Loyalists (loyal to the British crown) oppressed the Nationalists (loyal to Irish nationality) and times were bad. Protests against the governing regime started in the late 1960s. Over time, events escalated until January 1972 when British troops fired into a peaceful protest about the arrest and jailing of people without a trial. The British soldiers killed and wounded 26 unarmed civilians. That event kicked off a period of killings, bombings, and retaliations that went on for years. I remember seeing news programs about what was happening in Northern Ireland at that time and it was not pretty. Mural in Derry, Northern Ireland. I always thought the conflict was based on religion because it pitted Catholics against Protestants, but that was wrong. The conflict was based on loyalties, either to Britain or Ireland, which goes back a long long ways in history. In the 17th century, King William thought he could settle some of the Irish uprisings by sending over loyalist Scots to settle in the northern counties Ireland and calm the place down. The Scots became Irish in culture but remained loyal to the King. As Ireland fought for its independence, the counties of Northern Ireland sided with Britain. When Ireland was granted independence in 1922, the country was split into two countries: the Republic of Ireland in the south and Northern Ireland in the north that remains part of the British Empire. That’s when The Troubles really began. A lot of people died during The Troubles and a great many of them were innocent bystanders. The most famous victim of violence was Lord Mountbatten (uncle to the Queen) when his boat was blown up, killing him and his staff aboard. In the early 1970s, ten people jailed for being associated with the Irish Republican Army starved themselves to death in protest of being jailed without a trial. 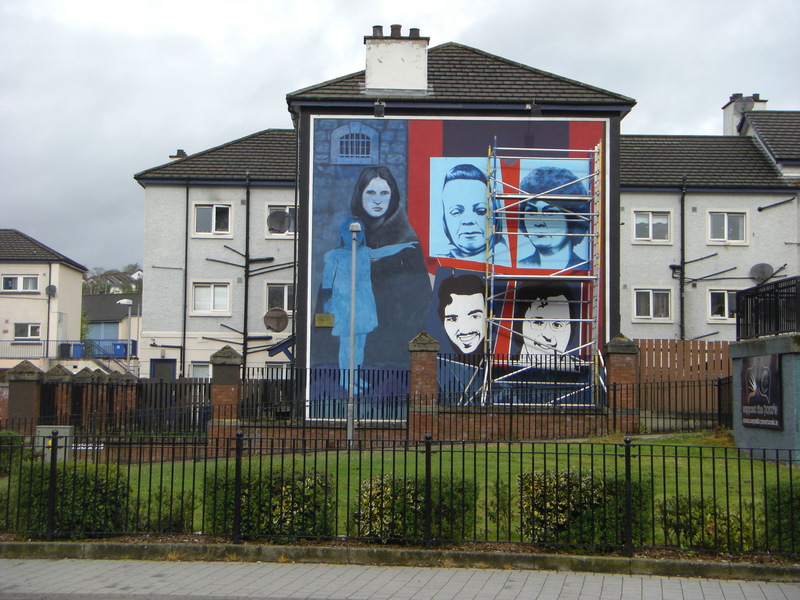 Belfast and Derry have many murals depicting events of The Troubles. The Troubles continued until the 1990s when the prevailing political party of Ireland, Sinn Fein, began negotiating with the British government. With the help of President Clinton, an agreement was reached and peace settled on the land. The hostilities are still there, but muffled for now (remember in the last blog the Irishman who told us there is a thin veneer on civilization). As the old guard fades with time, the next generation will enjoy their peaceful home and work hard to maintain it. The odd thing, or maybe the most fortuitous, is that the former protestors and bombers are now the politicians running Ireland. They discovered they can affect change politically instead of violently. Didn’t Nelson Mandela and Mahatma Gandhi both have that same idea? It worked well for them so we can only hope it works in Ireland. Seems like Martin Luther King did too. 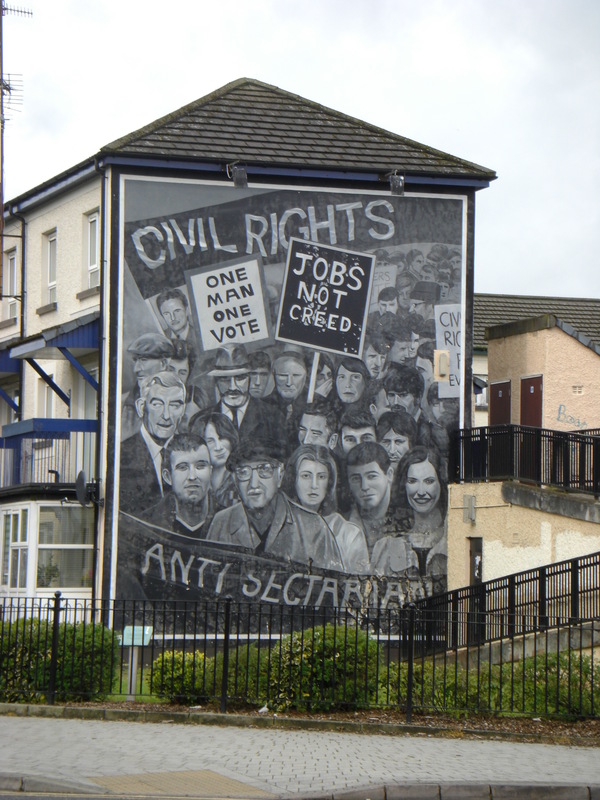 One of the murals we saw, but unfortunately didn’t get a photo of, had a picture of President Nixon with the title, “Our politicians went to jail before they were elected.” Considering the peace that’s replaced violence in Ireland, South Africa, and India, maybe it’s the way to accomplish change. Maybe the best politicians are those who suffered for equality and self-rule and appreciate what’s best for the majority of people. Contrast that with our politicians who only appreciate their own power and prestige. Maybe we should elect politicians who have suffered for noble principles, then elect them to office. Ireland could teach us a lot about the peace process. And protestors could learn from them about to bring change. Do it politically rather than violently for the good of the many.